Joggernauts will look familiar to those who've followed the indie scene on Nintendo platforms, especially anyone who's played Runbow and Runner3. It's a colorful, lighthearted 2D auto-runner that supports solo play and co-op action for up to four players. 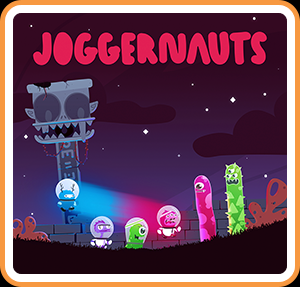 Filled with some inventive mechanics, lovely music, and cheerfully-chaotic multiplayer mayhem, Joggernauts nevertheless struggles to keep pace, due to an inferior solo mode and too few levels. The story in Joggernauts is short and slight, but undeniably fun. Basically, an interstellar track team is flying home from a big win at the Uranus Invitational when someone (who will remain nameless) spills joggerade all over the ship's manifold, causing an explosion and stalling the vessel. After a stern lecture, the team's robotic leader, C.O.A.C.H., tasks his runners with exploring the three moons orbiting the nearby "backwater planet" to locate his personal trophy collection—and, while they're at it—the ship's missing components. Although C.O.A.C.H. really only makes his digitized voice heard during the game's intro and outro, he still leaves a lasting impact, due to some comical reprimands and even a fourth-wall break. Anyway, it's not C.O.A.C.H. but rather his squad that does all the running, jumping, and switching in Joggernauts. Up to four players will choose a team member—six are available at first, with three to be unlocked—and then set off across three alien moons, with seven levels apiece. The game scrolls automatically from left to right, so players need only time their jumps, falls, and switches according to the rhythm and layout of each level. Everything in Joggernauts is color-coded, so couch co-op players (or solo players, controlling two runners at a time) will need to use the Y button to swap from the back of the conga line to the front, to activate floor panels and destroy each moon's hostile fauna. Only a red runner can flip a red switch, for example, and only a green jogger can destroy the green segments of the caterpillar-like waggler. It's an accessible, easy-to-learn formula that benefits from a gradual learning curve and some inventive stage mechanics and layouts. Early levels take place on mostly even terrain, with a few spiky monsters blocking the way, but later levels experiment with colored platforms, jump pads, underground caves, low gravity, industrial areas, and switches. Things can get sticky starting on the second moon, but developer Space Mace offers relief in the way of mid-level checkpoints and a series of modifiers, which can increase your hit points, make checkpoints more plentiful, or even slow the pace of the game down to three-fourths or one-half speed. Conversely, players can handicap themselves by turning those same modifiers against themselves. Unfortunately, experiencing these stage designs and obstacles solo is not nearly as engaging or rowdy as playing them with friends in the same space. Billed as "a switching game about NOT killing your friends," Joggernauts is intended clearly to be played with others. Single-player action is lonelier and less interesting, and more demanding also, as it pulls the hemispheres of your brain in two opposing directions. Solo players must control two independently-operating runners at once, using A to jump with the forward character, up on the D-pad to jump with the rear character, and Y to swap their positions. It's a bit of a mental juggling act. Both solo and co-op modes are hamstrung a bit by a general lack of content. The game's 21 levels fly by quickly. Space Mace creates opportunities to replay each level—each has two collectible trophies and later on two "glowtonium trophies" to find—but more environments and episodes are needed. There's no shortage of gameplay ideas and color-based puzzles in Joggernauts, so why should there be a shortage of stages? On the artistic side of things, Joggernauts sports some very simple but effective assets. The game is bright, colorful, and even atmospheric, thanks in large part to an unexpectedly enchanting, eclectic musical score by Robert Frost III. There are mellow, jazzy songs, thumping electronic tracks, and even the odd bluegrass polka. "Mushroom Canapé" and "Franklin P. Smellybelly, Esquire" are two of the best. With plenty of clever color-coded challenges, frenzied four-player platforming, and lovely music and art, Joggernauts is a fair installment in the auto-running sub-genre. With a deeper single-player campaign and more moons and levels, it could be even better. This review is based on a digital copy of Joggernauts for the NS, provided by the publisher.